Does Page Load Time Matter for SEO? Page load time is defined as the time it takes for a webpage to fully load in a browser showing all elements of a page. Does relative page load time matter for SEO? Here's a question that has come up on my radar a few times over the last few months. In fact, Matt Cutts of Google recently spoke about it in one of his many blog videos (link below). So, with so many people wondering does the speed to load a page affect SEO, what is the answer? In short, the answer is yes, page load time does matter. Okay, Matt Cutts confirmed that page load time is a factor in ranking a site, but how important is it when it comes to ranking in the SERPs? It's apparent that while page load speed is collected and measured as part of Page Rank, (along with over 200 other variables), it is reasonable to suggest that this variable is a low priority or low/moderate variable. It is a low priority unless the speed is so slow that it affects the ability for Google to visit and collect data from your site. I personally visited plenty of web pages in many categories and went through them all keeping track of page load time. Many links on the first page were slower than pages on the second, third, fourth and fifth page of listings. In addition, I tried to take a pulse of what other SEO professionals and web developers were saying about this as well. From watching the Matt Cutts video (link located below) and many other videos along with information regarding SEO released by Google and other search engines, the key point they try to drive into web developers and SEO/SEM professionals heads is that a quality built site that offers visitors the best web experience should be the goal when building a site. So, if your site is filled with unnecessary code, filled up with distracting media and difficult to navigate, not only will the user experience lack, but this will also be reflected in reduced rankings. Being a part of the SEO industry, I understand that part of success is paying attention to the details. While load speed may play a minor role in rankings, if you are currently building a new site/page or tweaking a site, it pays to look at the load speed and improve it if necessary. Google is now stressing load speed with their improved Google Analytics code (found here: https://code.google.com/apis/analytics/docs/tracking/asyncTracking.html). I definitely recommend that you not only add this code to the bottom of each of your web pages, but also localize the Java script file. This code now features what they call asynchronous syntax which, as Matt Cutts explains, is a piece of Java code that will not load until after the web page loads (this improves efficiency of load times). 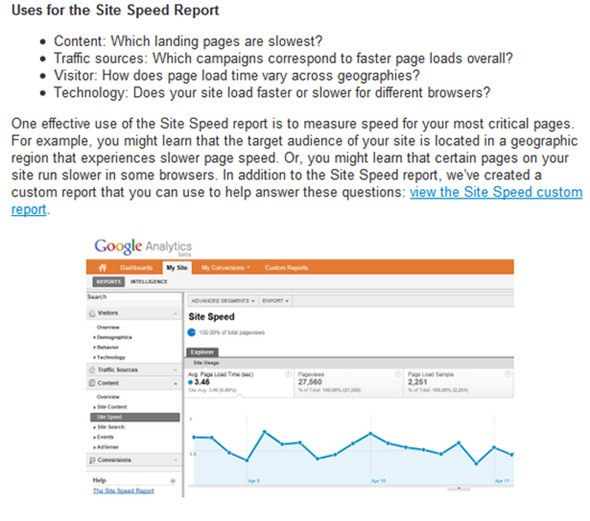 In addition, Google has unveiled a new tool to measure site speed with analytics reports (found here: http://analytics.blogspot.com/2011/05/measure-page-load-time-with-site-speed.html). This tool shown below can be a great way to determine which sites/pages are loading slowly and how to remedy the situation. Obviously, there are many factors involved when it comes to the time it takes for a web page to load such as the code itself on the page, possible errors, the amount of text, images, media such as video, widgets, etc. Other factors can also include: your internet connection speed, your browser, the speed of site's server, amount of traffic trying to access a site and distance between your computer and the site's server. While there are many factors involved, generally speaking Google will determine the speed of your site by the time "it" takes its assets to access your full webpage, so keep that in mind when you use other tools and find a discrepancy in times for loading.